I'VE NEVER BEEN A HISTORY BUFF BUT...THIS IS SOME NEAT STUFF. The Raab Collection sells historical documents signed by influential figures including Einstein, Napoleon, Washington, Lincoln, Churchill and our Founding Fathers. They're more than just a seller; they're internationally-recognized experts focused on providing quality and authenticity to the most discerning document collectors. This redesign features a new visual design language and user flow that invokes a white glove-like feeling when experienced online. 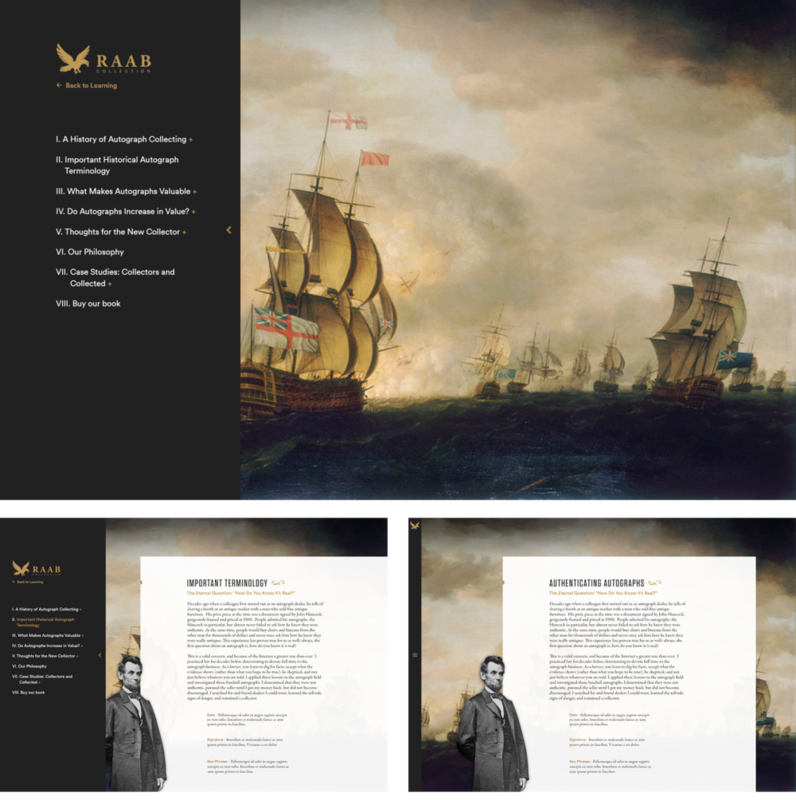 While creating Raab Collection's site, I learned about their family, their craft, and I bettered myself as a designer. In addition to all of that it was near impossible to avoid picking up pieces of historical trivia along the way. Specifically when it came to the guide section of their site. My quizzo team would disagree, but I picked up a lot while finding a way to organize all of the information they had on historical figures. 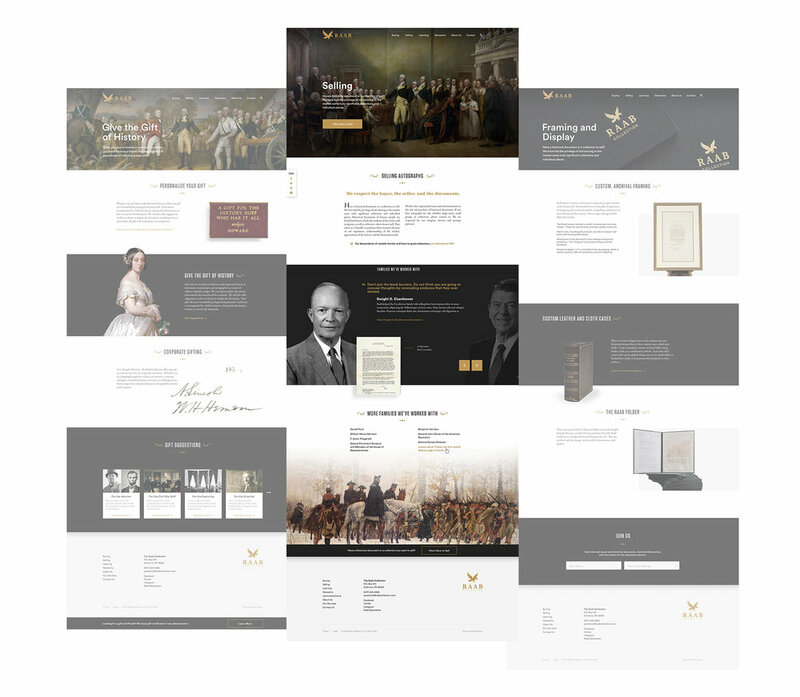 Their learning section is vast and beneficial and it deserved a design that was easy to navigate and user friendly. The Rabb Collection site has an immense amount of knowledge regarding starting your collection, maintaining your collection, or selling your collection. All of this information was originally found in the learning section of their page. However, through years of adding to it and altering it, the sections got lost and misplaced resulting in a valuable section of their site that was difficult to navigate. In order to simplify this experience I combined it into one cohesive guide with a sidebar navigation system that outlines each section of information. Once a user clicks on the section they're interested in, the information slides up and they're ready to read. The sidebar also collapses to prevent the space from feeling crowded and busy while reading.